You can read my THIS POST to know how to run selenium webdriver test of software application in Mozilla Firefox browser. As you know, webdriver software testing tool support Google Chrome browser too. You need to do something extra for launching webdriver test in in Google chrome browser. Let me describe you steps to launch webdriver test in Google Chrome for software web application. 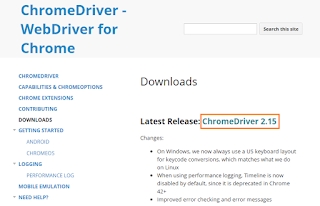 First of all, download latest version of ChromeDriver server for webdriver software testing tool. You can download it directly from https://sites.google.com/a/chromium.org/chromedriver/downloads. Current latest version for win32 is "ChromeDriver 2.15" as shown bellow. 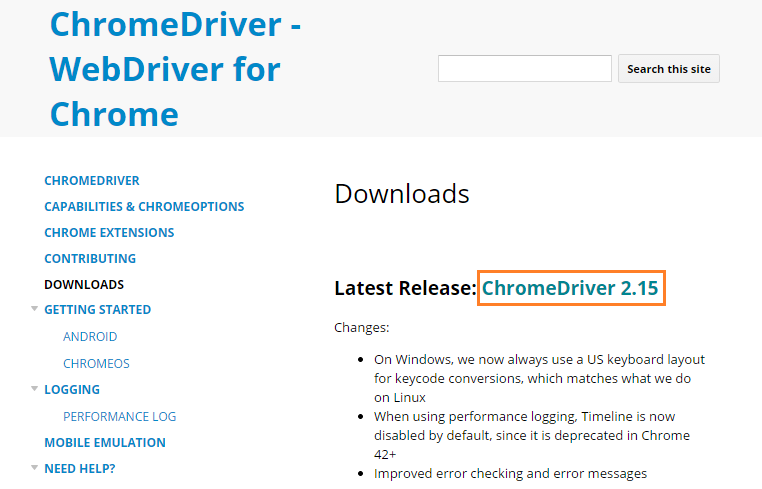 Click on "ChromeDriver 2.15" link. It will take you to download page. 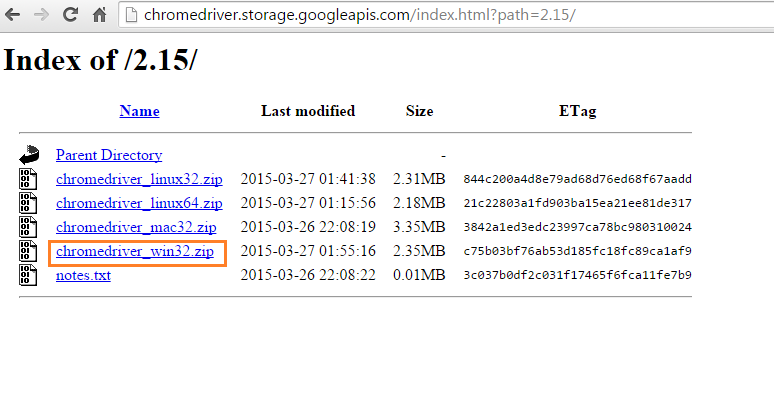 Click on link shown above to download chrome driver zip file. On completion of download, extract zip file to D:/ drive. Now in eclipse, create new project with name = 'chromeproject' and create new class with name = 'chromebrowser'. Don't forget to select 'public static void main(String args)' method during new java class creation. Write code as shown bellow in class file. So now, your software web application's test will run in Google chrome browser. Learn how to execute webdriver test in Internet Explorer browser in THIS POST. Is ChromeDriver not available for win64??? directly we set home path or any other. i'm getting error as "The method SetProperty(String, String) is undefined for the type System" also my sytem is win64. good effort. Can I get code please? I'm very new to Java...I've a que. regarding the 'import' line..what is it about? 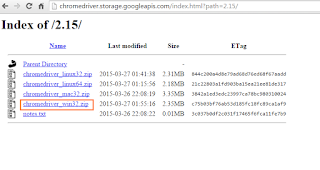 Why didn't have to download FireFoxDriver Server just like that for ChromeDriver? You not need driver server file for firefox. You need It for other browsers ike chrome, IE, etc.. I am facing one problem here, as I run the above test i can see the below error. Can you help me in running the test without fail. How did you resolve this error? I am facing same issue. this code of line shows the below error please help me. t has a simple solution. Change your compiler compliance level from 1.4 to 1.7. Now check your code. it will never show the same error. In above code I facing problem in "sendkeys" it showing The method sendKeys(CharSequence) in the type WebElement is not applicable for the arguments (String). I can't understand whats d meaning of this. Please reply !!! Even I had faced such issue with SendKeys.After updating to the latest version of the WebDriver, issue got resolved. We need to have latest version of Browser and WebDriver as well..
Is ChromeDriver not available for win64 ??? I am getting the following error. Can someone please help me on how to proceed?